From peglegged Peter Stuyvesant to CBGB’s, the story of the Bowery reflects the history of the city that grew up around it. It was the street your mother warned you about—even if you lived in San Francisco. Long associated with skid row, saloons, freak shows, violence, and vice, the Bowery often showed the worst New York City had to offer. Yet there were times when it showed its best as well. The Bowery is New York’s oldest street and Manhattan’s broadest boulevard. Like the city itself, it has continually reinvented itself over the centuries. Named for the Dutch farms, or bouweries, of the area, the path’s lurid character was established early when it became the site of New Amsterdam’s first murder. A natural spring near the Five Points neighborhood led to breweries and taverns that became home to the gangs of New York—the “Bowery B’hoys,” “Plug Uglies,” and “Dead Rabbits.” In the Gaslight Era, teenaged streetwalkers swallowed poison in McGurk’s Suicide Hall. A brighter side to the street was reflected in places of amusement and culture over the years. A young P.T. Barnum got his start there, and Harry Houdini learned showmanship playing the music halls and dime museums. Poets, singers, hobos, gangsters, soldiers, travelers, preachers, storytellers, con-men, and reformers all gathered there. Its colorful cast of characters includes Peter Stuyvesant, Steve Brodie, Carry Nation, Stephen Foster, Stephen Crane, and even Abraham Lincoln. The Bowery: The Strange History of New York’s Oldest Street traces the full story of this once notorious thoroughfare from its pre-colonial origins to the present day. Stephen Paul DeVillo has spent a lifetime exploring the history and lore of his native New York City. An experienced historical tour guide, he is the author of The Bronx River in History and Folklore. DeVillo lives in the Bronx, NY. "DeVillo summons up an eclectic cast, including Buffalo Bill, Big Tim Sulivan, and Eddie Cantor to recall a fabled thoroughfare." 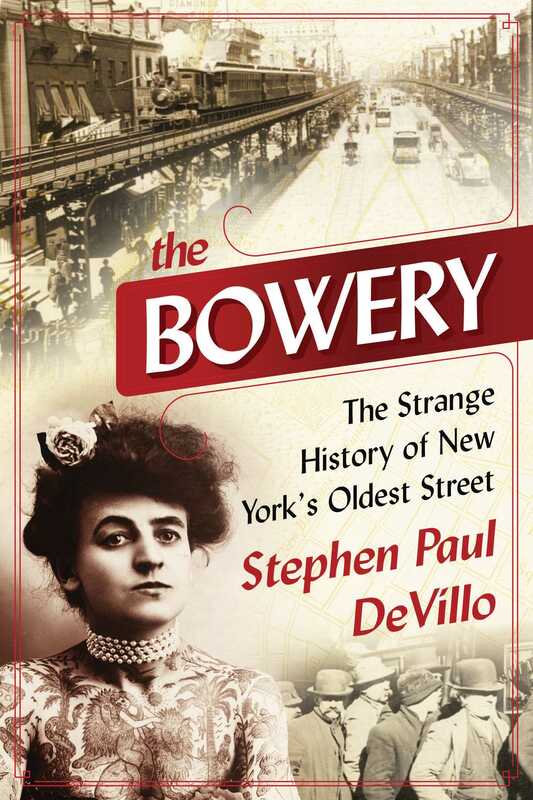 "A cheerful, accessible history of Manhattan seen through the lens of its oldest street, the Bowery. Written in a witty, conversational tone . . . this is a breezy, fact-filled trip through NYC history." "DeVillo has written a thorough and entertaining account of one of the most notorious streets in Manhattan. Well researched and entertainingly written, he has captured all the pathos and drama of the Bowery as only an aficionado could have. A must-read for fans of New York City history!"